The Maryland Department of Natural Resources is offering a variety of wildlife education trunks for use by classroom teachers, home-school educators, naturalists, scout leaders and other instructors. These unique, interdisciplinary teaching tools designed to educate and engage students about local wildlife while building on fundamental disciplines like art, language arts, math, physical education, science and social studies. 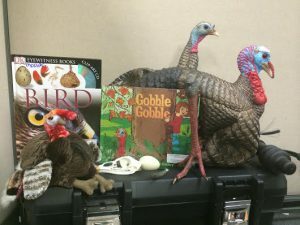 “These trunks allow educators to bring wildlife into their classrooms with hands-on teaching tools like real pelts and activities to learn about the biology and ecology of the wildlife represented,” Wildlife and Heritage Service Education and Outreach specialist Kerry Wixted said. Each trunk contains an educator guide with background information, lesson plans and hands-on K-12 activities, as well as activity supplies, books, furs, replica tracks, videos and other hands-on items for a complete educational experience. Wildlife education trunks are available for a variety of subjects, including aquatic invasive species, bats, black bears, furbearers, white-tailed deer and wild turkeys. These trunks can be borrowed free of charge on a first-come, first-served basis for up to two weeks. They are available at seven locations around the state. More information is available online.